Dvorkin was careful to say that it's still early days and there remains much to be determined, but the overall thrust is pretty much what you would expect: A lot of the True/Slant content that doesn't fall into Forbes' areas of focus -- business, investing, economics, government, health care, etc. -- will likely disappear, and the writers who produce it will either need to find new topics to write about or new outlets to write for. 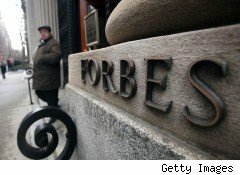 "Forbes is different than True/Slant," Dvorkin said. "There are a lot of things they don't do. They don't cover ice skating [for example]." "More Directed, More Focused, More Angled"
All T/S bloggers will be kept on and paid through June, but during that time, Dvorkin and Forbes will determine which ones to keep and which to drop. Niche blogs in areas outside Forbes' ken -- such as, say, a fan blog about a single football team in the NFL's smallest media market -- are likely to go, but so are those blogs whose focus is too nonspecific. "Moving forward, the generalists' role ... would not be the best way to go," Dvorkin said. "A lot of the pages will be more directed, more focused, more angled. In a humane touch, those writers who aren't invited to stay on will have the option of migrating their archives onto a new WordPress blog with technical assistance from True/Slant. Dvorkin was asked a couple of times whether the True/Slant brand will continue to exist or will dissolve into Forbes Media altogether. He demurred. He did shed some light on the motivation behind the deal, however. Forbes, he said, has realized that "you cannot get big enough in an economic way just having in-house folks.... They also know the outside-contributors expert model -- that has to be grafted onto the larger model for Forbes to grow." From True/Slant's end, he said, refocusing its resources in the editorial niches Forbes occupies will help with ad sales. "Our monetization is fairly small," he added, "almost infinitesimal right now compared to what it would need to be to be a truly successful business enterprise."